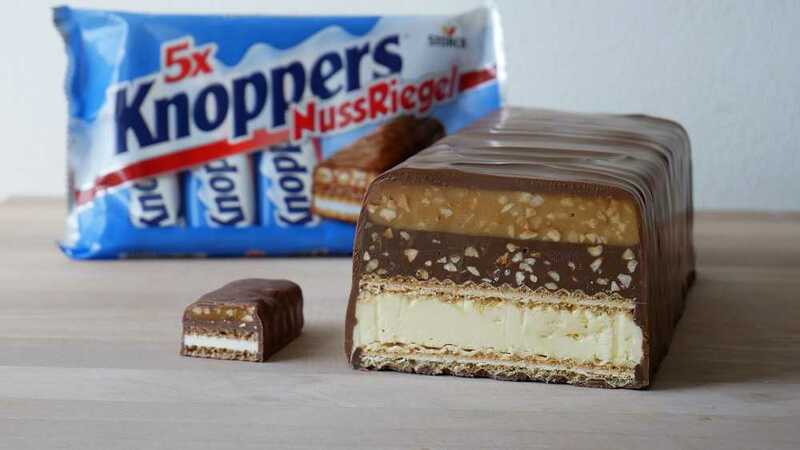 A Knoppers Nut Bar is a German chocolate bar & consists of 5 layers: caramel with hazelnuts, hazelnut cream, a waffle in the middle, milk cream & a last waffle covered with milk chocolate on top. In today’s post, I’ll show you how to make a giant Knoppers Nut Bar at home. Have fun baking! 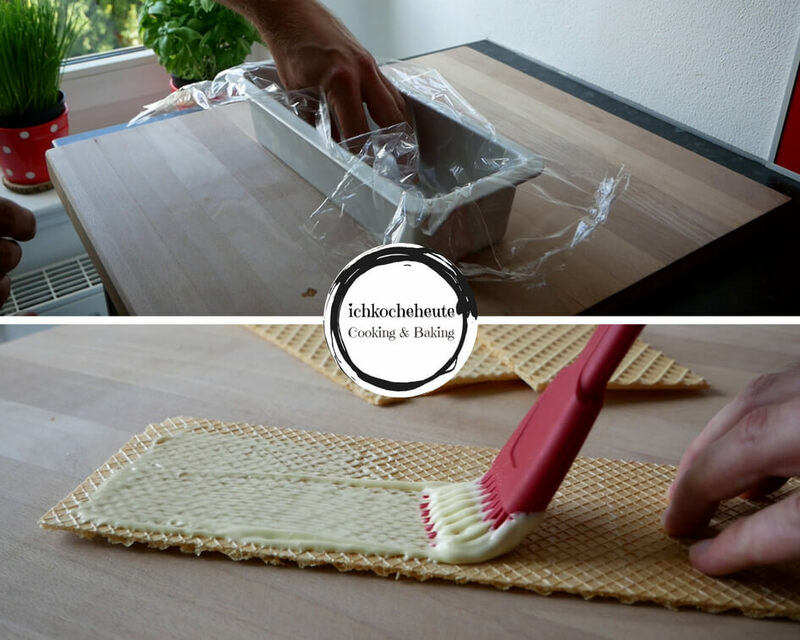 Grease a loaf pan (30cm x 10cm) with some oil at the sides & bottom of the pan & line with a sheet of cling film as smooth as possible, then set aside until further use. Melt 50 grams of white chocolate over a double boiler or in the microwave & use the melted chocolate to glue together 2 wafer sheets, then put the glued wafer sheets aside and allow to harden a bit. 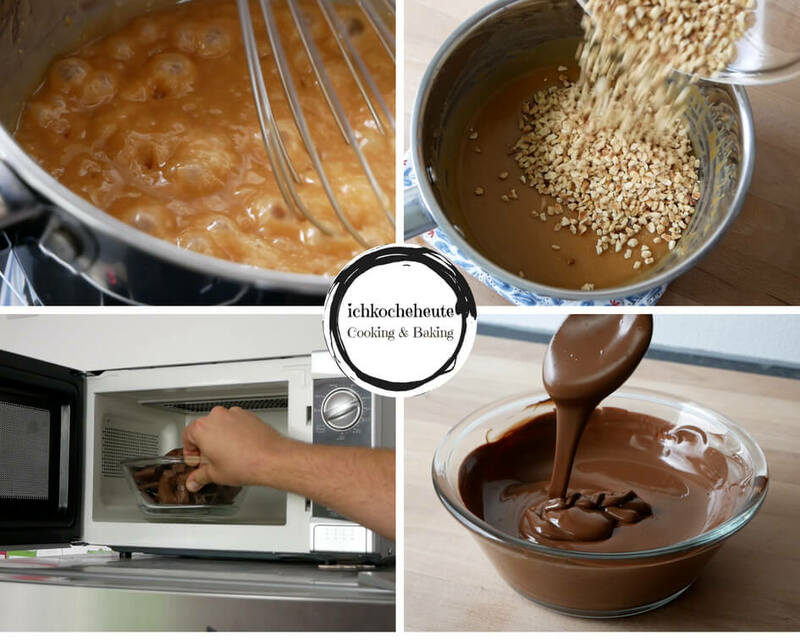 In a saucepan combine 300 grams of soft caramel sweets along with 75 milliliters of cream & 50 grams of butter, heat up over low to medium heat and melt the caramel sweets while stirring constantly. Remove the melted caramel sweets from heat, mix with 100 grams of chopped & roasted hazelnuts & then pour into the prepared loaf pan & smooth down. Put 200 grams of whole milk chocolate, 150 grams of sliceable nut nougat, 75 grams of Nutella & 75 grams of dark chocolate into a mixing bowl & melt over a double boiler or in the microwave. Next, add 150 grams of roasted & chopped hazelnuts to the chocolate mixture, give everything a good stir & then transfer the hazelnut cream into the prepared baking pan and smooth down. Afterwards gently press one of the prepared waffle sheets on top of the hazelnut layer, then set aside. Put 25 milliliters milk & 50 grams coffee creamer into a mixing bowl & stir together until smooth & the creamer has completely dissolved. Then add 150 grams soft butter & 75 grams powdered sugar & stir together with a mixer for about 1 – 2 minutes until white & creamy. 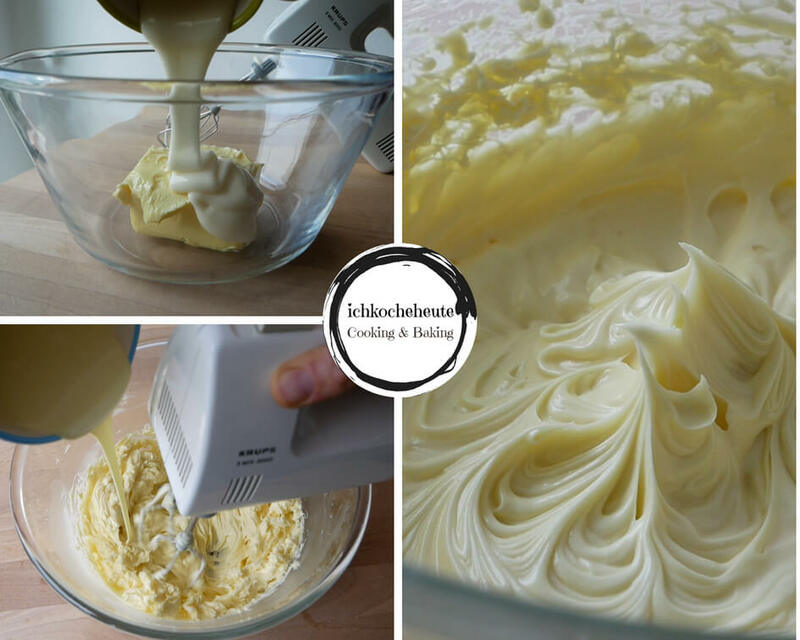 Next, melt 125 grams of white chocolate over a double boiler or in the microwave, add to the mixing bowl and mix in for another 1 – 2 minutes. Put the done milk cream into the prepared loaf pan & smooth down. Finally, gently press the second waffle plate onto the milk cream and brush everything evenly with 100 grams of melted milk chocolate. Put the layered Knoppers in the fridge for at least 3 – 4 hours (preferably overnight). After cooling time, melt 300 grams of milk chocolate over a double boiler or in the microwave. Line the worktop with a sheet of baking paper, centrally place 2 equal high coffee mugs onto it & carefully set the Knoppers Nut Bar on top of the mugs. Then pour over the whole bar with melted chocolate until the bar is completely covered with chocolate. 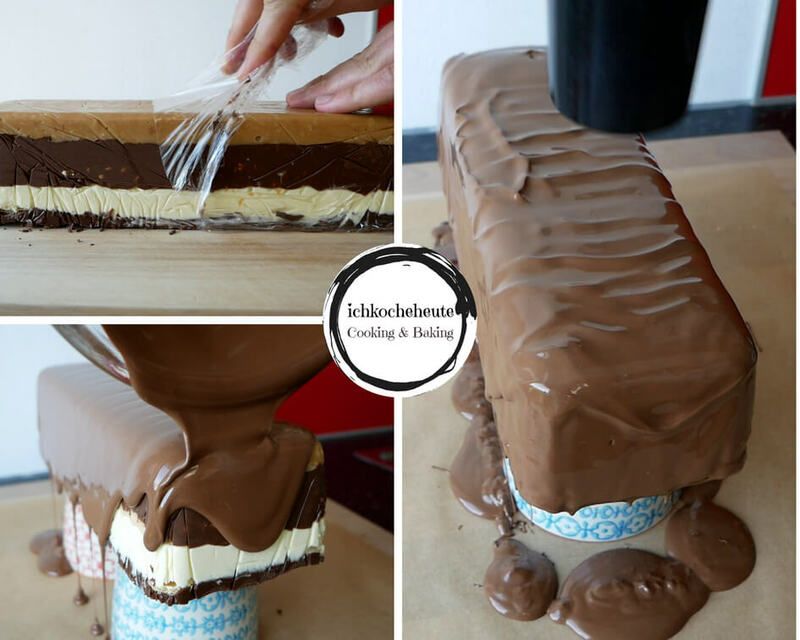 Afterwards use a hair dryer for the typical wave pattern on the surface of the chocolate bar and “blow dry” from front to back until stripes or waves appear on the surface. Finally, remove the excess chocolate tips at the bottom of the bar, then allow the Knoppers nut bar to harden completely and serve.